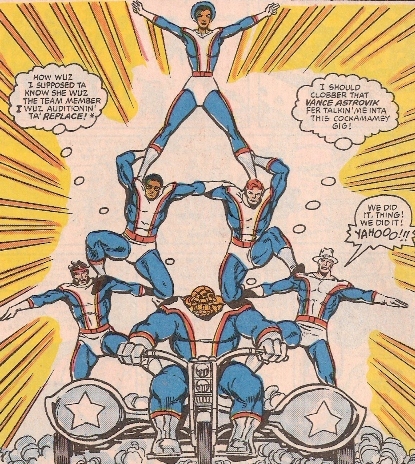 (The Thing I#27 – BTS) – Having lost the trademark to the name Team America, the group of stunt riders decided to reform, expand their roster, and change their name. They settled for the name “Thunderiders” and began touring. (The Thing I#27) – The team was out driving, preparing for their next show, when they almost ran over Ben Grimm (Thing) and his friend Vance Astro. It was Astro’s telekinetic abilities that prevented a major wreck. When the former member of the Fantastic Four walked into their temporary base camp, Reddy offered his apologies. When Sharon Ventura made plans to leave the team, tryouts were held to find her replacement. The choice came down to the brash but talented Richie “The Champ” Champulion and Grimm. Despite a weaker showing, the team voted on Grimm. Champulion, unknown to the team, was a mutant and a part of the New Genesis Project. Summoning the Marauder’s powers, he battled with the Thing until he was subdued. The team was shocked at the discovery. (The Thing I#28) – Grimm had been with the team only two weeks. Outfitted with a Thunderiders uniform and part of the promotional campaign, Grimm still felt his place was elsewhere. After rehearsing for a major stunt, Grimm announced his desire to leave the group. As a parting gesture, he offered to play back the team for the custom motorcycle they had built for him. Comments: Created by Mike Carlin (script), Ron Wilson (pencils) and Brett Breeding (inks). A bit of meta-commentary as Reddy grouses that they lost the trademark to the name Team America. Everything seemed primed to have the team be featured more, but this was it. Also, the cover and first appearance make it clear that their name is spelled Thunderiders, not Thunderriders.